It is required for all women to wear a veil during this event as a form of respect towards the Virgin Mary. It is requested for all the wear white in order to show our love and give value to the apparition of the Virgin Mary on the holy ground of Koyari. All religious items will be blessed. All present and all who are aware of the apparition and pray with will receive blessings, especially when following our live broadcast and participating with the prayers of the Holy Rosary. The messages given during this event are for the world and are published with on this website and are available in printed form in the Chapel at Koyari. 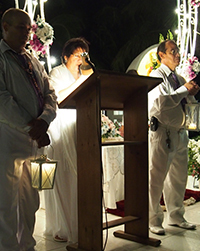 Prayer petitions provided on this website are provided to the Virgin Mary and Jesus during Their apparition. 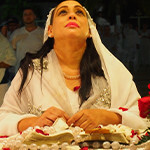 This Virgin of Grace of Aruba has been appearing to Mrs. Valerie Perez since 1998.